Greece is one of your favorite beach destinations. You’d be happy if you could spend all summer, every summer in the Cyclades. A sailboat would drop you off in a different, hidden cove each day. All meals would be eaten at little tavernas just steps from the sand. You’d always be within sight of the sparkling turquoise water. But there’s more to Greece than just the waterfront. Shockingly. The off-season is the perfect time to explore the country’s mountains. As Greece’s largest island, Crete has miles and miles of gorgeous coastline. It also has an unspoiled interior. Western Crete, called Chania, is already known as the forgotten corner of the island. Once you head inland, it’s a nature lover’s dream. Lefka Ori (the White Mountains) is bald, as no vegetation grows in the higher elevations. Hiking trails—plus kri-kri (wild goats)—wind through Samaria Gorge, the Grand Canyon of Greece. Lake Kournas is the island’s only freshwater lake. While golden eagles and Lämmergeiers fly above the large plane trees. 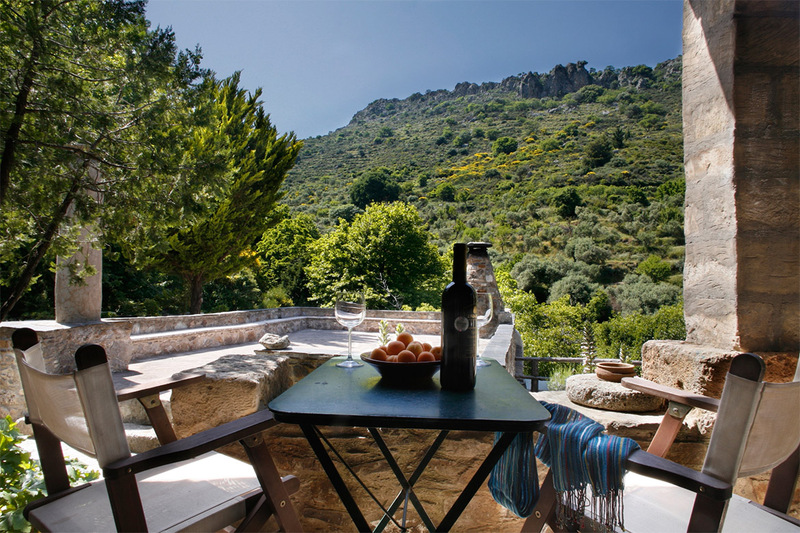 Milia is hidden among the trees and the hiking trails in the valley created by Kefali and Psilo Mountains. The little village, accessed from a narrow road near Vlatos, was built in the 1400s. It grew to include 16 stone farmhouses. But life in the remote village was difficult. Young people left to find work elsewhere. Older people died. Milia was eventually abandoned. Then Milia was revived. The eco-friendly Milia Mountain Retreat opened in 1993. The village’s farmhouses were turned into apartments. 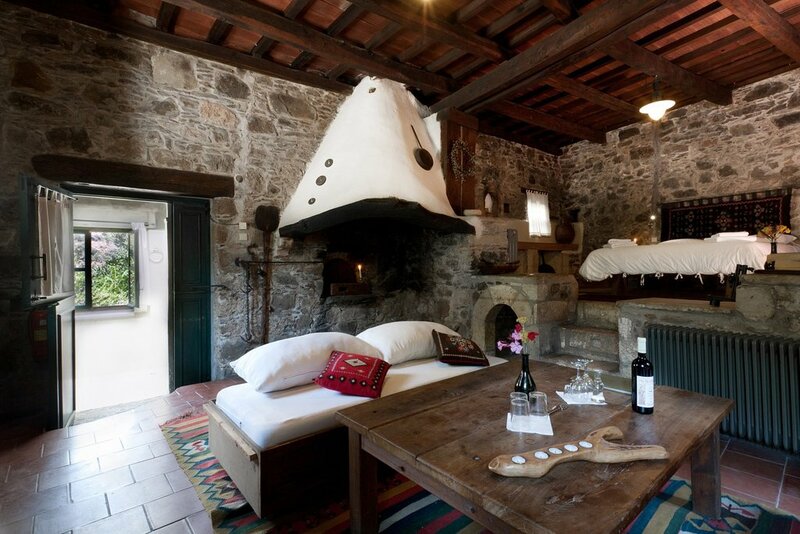 Their stone walls, exposed wood beams, and fireplaces or wood stoves remained. Only minor changes—like the addition of bathrooms, solar power, and central heating—were added. A new restaurant followed in 2000. It uses a big wood stove, meat raised on the property, vegetables from the organic garden, and products from nearby villages. The retreat has turned into a quaint spot where time seems to move much slower. In today’s busy world, time moving slower isn’t a bad thing. At the Milia Mountain Retreat, you wake up in a warm duvet and, for once, don’t rush to get out of bed. You drink coffee and watch the shadows disappear on the terrace. You drizzle your breakfast with aromatic honey. Then you pause at Kato Milia, the village’s tiny chapel, before beginning the rest of your day. The rest of the day can be as active or low-key as you wish. Seven labeled trails extend out from Milia. Each hike lasts from one to five hours. Cooking classes are offered on Wednesday afternoons. They include lunch and plenty of wine. There’s an exhibition space devoted to art, music, and even yoga. While hammocks, board games, and books are hidden in little nooks. Just don’t miss dinner. Fresh Cretan salads, an aubergine spread, and apáki (smoked pork bites) start the long meal. Boureki (a layered zucchini casserole) and sautéed lamb cooked in olive oil are among the main courses. While a soft goat-cheese pie, again drizzled with honey, appears just when you think you can’t handle one more bite. You can handle it. Just like you can handle being away from the coast.